The same immunoassay technology that is used to detect illicit drugs in urine can also be used to detect cotinine in urine. Cotinine is a metabolite created when the body processes nicotine. A Cotinine Test can be used to determine if someone has been using tobacco. It is a great tool when you are trying to quit, or if you are trying to detect whether someone who should not be smoking is doing so. 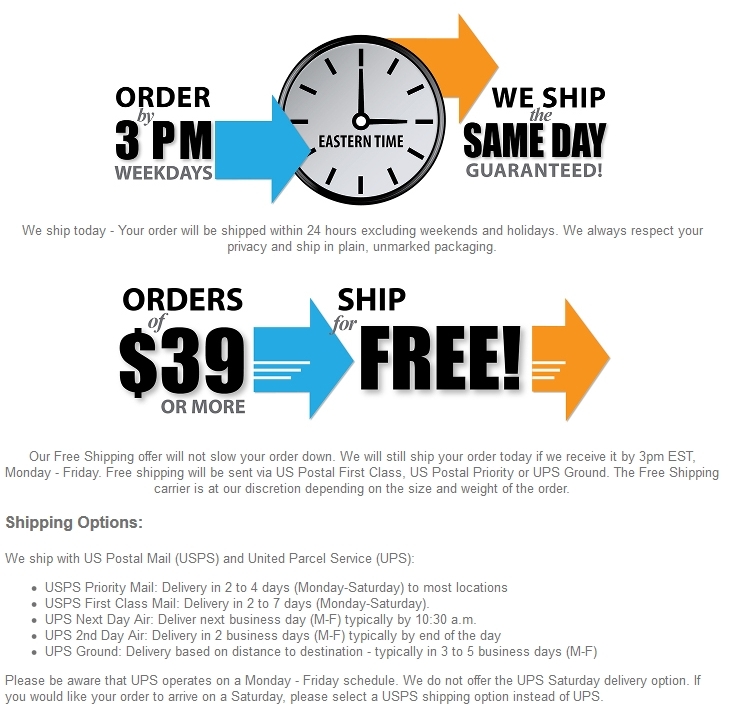 Similar to a home pregnancy test, the Nicotine Test is a one time use, urine drug test. In just 5 minutes you will know if an individual has used tobacco in the last 2 to 4 days. Nicotine is a very unstable drug. When a person uses tobacco, the body immediately breaks nicotine down into about 97 different metabolites, the most stable of which is cotinine. By testing for cotinine, you can reliably determine if a person is using a nicotine product. Any method of directly taking in nicotine can show up on this test, including cigars, cigarettes, chewing tobacco, nicotine gum and electronic cigarettes. You must provide your own container for the collection of the urine, and a timer so you may follow the instructions precisely. Cotinine stays in a person's system for a period of 2 to 4 days. You will be able to find out if cotinine is in the urine by reading the test device 5 minutes after putting the urine into it. A negative result means that a line, no matter how faint, appears in the "T" aka Test Line Region of the tobacco test. If no line appears at all in the "T" Region then the sample is positive for cotinine, or in other words, positive for nicotine. If you would like more information on Nicotine Tests, please see our article, Nicotine Tests and Insurance Policies, and our Nicotine Testing blog. Make sure the test device and the urine sample are at room temperature. Once opened, please use the test device as soon as possible. Place the device on a clean, level surface. Hold the dropper vertically and slowly transfer 3-4 drops of urine to the specimen well labeled "S." Avoid trapping air bubbles in the specimen well. When done, start a timer. Wait for the colored line(s) to appear. Results should be read at 5 minutes. Do not interpret the result of your nicotine test after 5 minutes. 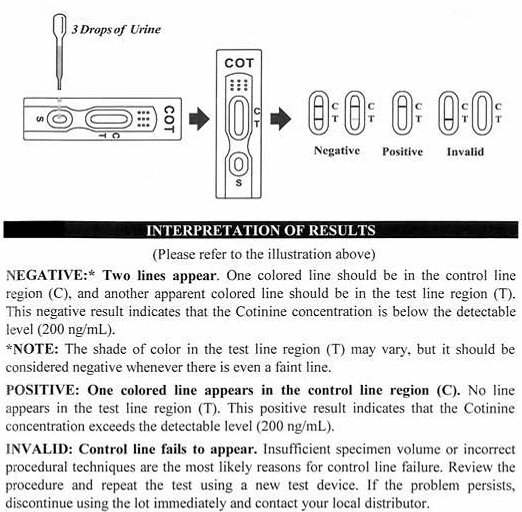 A colored line must appear in the Control Region (labelled C) of the test device to ensure it is working properly. If no line appears in this region, discard the device and retest with another test device. Negative for Nicotine - A colored line next to the "T" for Test Region on the device means the level of nicotine in the body is below 200 nanograms per mililiter, in other words below the cut-off level. The test is negative even if the colored line is very faint in the "T" region. The "C" and "T" lines do not have to be of the same intensity. Positive for Nicotine - No colored line at all appears in the "T" for Test Region part of the nicotine test device. This means the level of nicotine in the urine is over 200 nanograms per mililiter. Q: Can Electronic Cigarettes show up on a Nicotine Test? A: Yes. While e-cigarettes can deliver less nicotine than traditional cigarettes, they can still show up on a Nicotine/Cotinine test. Q: What is cotinine? Is cotinine the same as a nicotine/tobacco? A: Cotinine is the first-stage metabolite of nicotine. Cotinine is more stable than nicotine in urine, and that is why it is used for testing. Cotinine is actually a more reliable way to detect nicotine use than actually testing nicotine itself. A: This test works much like our other urine drug tests. The principle behind it is the same. However, this test is not dipped into a urine sample, but rather a dropper is used to collect the urine and put the urine on the test device. Q: Will this test detect quit smoking aids like nicotine gum? A: Yes. Any way of directly taking in nicotine will affect this test, including cigars, cigarettes, and nicotine gum. Second-hand smoke will not show up on this test though.